To make the yoghurt dressing, place the yoghurt, dill, mint, chives and lemon juice in a bowl, sprinkle with salt and pepper and mix to combine. Refrigerate until ready to serve. Preheat oven to 200°C (400°F). Make 4 deep incisions on each side of the chicken. Place the garlic, fennel, chilli, paprika and oil in a bowl and mix to combine. Rub all over the chicken and place, skin-side up, on a baking tray lined with non-stick baking paper. Place the beetroot, vinegar and maple syrup in a snug-fitting baking dish, sprinkle with salt and pepper and toss to combine. Top with a piece of baking paper and cover tightly with aluminium foil. 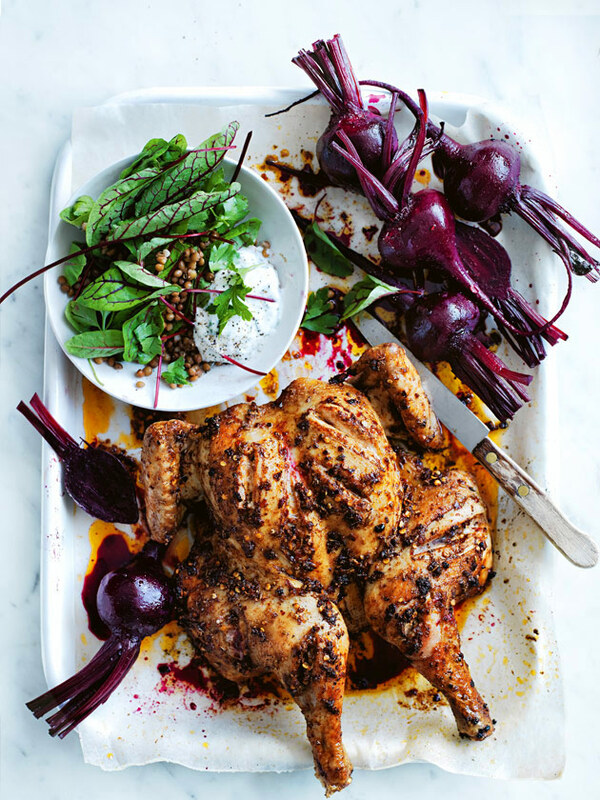 Roast the chicken and beetroot for 40–45 minutes or until the chicken is golden and cooked through and the beetroot is tender. Remove the beetroot from the baking dish, reserving the cooking liquid, and set aside to cool slightly. Place the lentils, beetroot leaves, reserved cooking liquid and parsley in a serving bowl and toss to combine. Place the chicken and beetroot on a large serving platter and serve with the lentil salad and herbed yoghurt dressing. Serves 4. +Butterflying a chicken allows it to cook faster and more evenly. To butterfly and flatten a whole chicken, position the chicken, breast-side down, on a flat board so the back is facing up and the drumsticks are facing towards you. Using sharp kitchen scissors or chicken shears, cut closely along either side of the backbone, remove the bone and discard. Turn the chicken over so it is facing breast-side up. Press down firmly on the breastbone to flatten the chicken. Tuck the wings under the chicken before roasting.